Washington: US President Donald Trump said he is keen to work with Prime Minister Narendra Modi on creating a “fair and reciprocal” trading relationship between the two nations and called for the removal of “barriers” for the export of US goods into Indian markets. 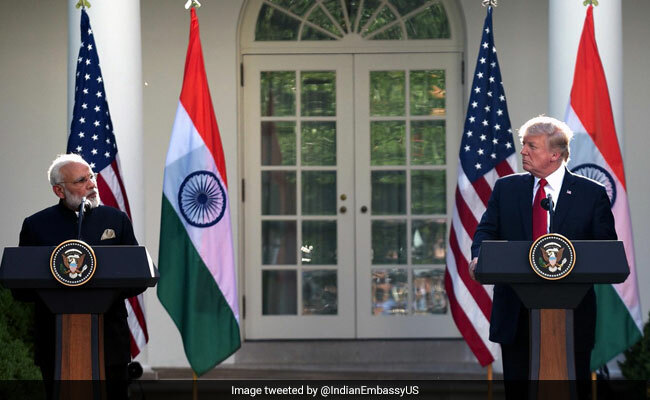 “I look forward to working with you to create jobs in our countries, to grow our economies and to create a trading relationship that is fair and reciprocal,” Trump said in his remarks at the White House Rose Garden following his meeting with Modi. Trump said it was “important” that barriers be removed to export US goods into Indian markets, “and that we reduce our trade deficit with your country. “Referring to the GST reform to be implemented across India starting next month, Trump said it was “the largest tax overhaul in your country’s history”. Trump expressed pleasure about an order by an Indian airline company for 100 new American planes, calling it one of the largest orders of it is kind, which will support thousands and thousands of American jobs. “We’re also looking forward to exporting more American energy to India as your economy grows, including major long-term contracts to purchase American natural gas, which are right now being negotiated, and we will sign them. Trying to get the price up a little bit,” he said.